You startup with just an android phone and if you do not have that either, you are trained to use any prospective client’s handset to serve him or her better. 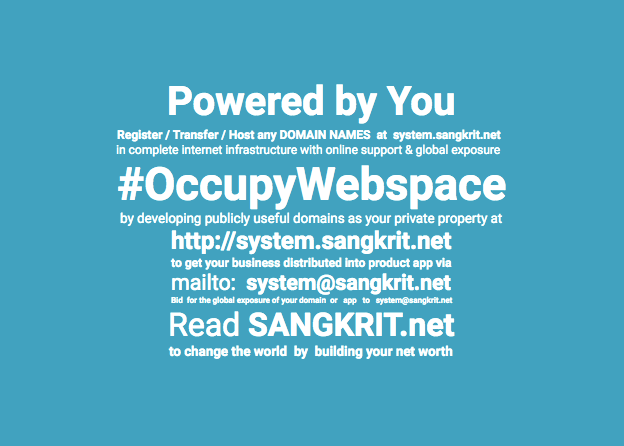 Simply ask your client to open the browser and type the web address as http://system.sangkrit.net for registering or transfering any desired domain name. Help in doing that too wherever necessary. Help your client in buying everything necessary for building his or her business online. Tell your name for any further help if required and share your contact details. Your being a humankind working from home is always appreciated in the business of upgrading humanity into internet age since you do not disappear the way many failing companies do. Therefore by not wasting any money on creating a firm, you upgrade your home for housing your office as well. Working as pesonal outlet of a globally distributed order for the people around you is the simplest kind of independent business. You need not do any formalities to begin with doing business while you get all cooperation from everywhere to let you succeed. Any order you take is fulfilled by an globally distributed order that works for fellowships independently paid to each-other. Everytime any money is credited direct into the concerned person’s personal saving account. Everybody is taxed as independent individual in his or her own country. Download android app Shardul Pandey from Play Store to cooperate.